First Line: It was Bouncer who found the leg. All the Reverend Francis Oughterard ever wanted was some peace and quiet, and he found it in a little village in Surrey called Molehill. But there's a loose thread that's going to cause his paradise to unravel: a woman of means named Elizabeth Fotherington. The insufferable Mrs. F. has set her cap at the vicar, and it's not until Oughterard accidentally strangles her in the woods that he realizes the effect she's had on him. The woman's body doesn't stay hidden for long-- a neighbor's dog has discovered it, and so the vicar waits for his life to be over. His drunken bishop and a couple of policemen tramping in and out of his house have his nerves shredded to bits, but help arrives from a shocking source: two abandoned pets, a cat named Maurice and a dog named Bouncer are there to save the day. I downloaded this book to my Kindle on the strength of the synopsis and recommendations from friends, and then I promptly forgot about it. I've been making a point to go back to read the earliest books I downloaded. I'm not much of a cat person, so when A Load of Old Bones started out with "The Cat's Memoir" in Maurice's voice, I didn't know how far I would be able to read. That uncertainty held until chapter three, "The Dog's Diary." When I read the very first thing Bouncer the dog said, I burst into laughter. This book reminds me of the old "Columbo" television series when you knew the identity of the killer and all you had to do was sit back and watch the detective put all the clues together to catch him. What made me a bit uneasy is how quickly I accepted Oughterard killing a woman and covering it up. It undoubtedly has a lot to do with the fact that the dreaded Mrs. F. is the type of person who makes most of those who meet her want to strangle her. As a fan of Spencer Quinn's Chet and Bernie mysteries, I have no problem with dogs (and the occasional cat) speaking to me, but what surprised me was how harmoniously the voices of Oughterard, Bouncer and Maurice blended together. Between the three of them, a reader gets the complete picture, and watching these two animals come to the aid of the vicar is laugh-out-loud funny. 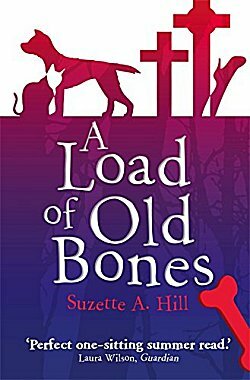 There is very little interplay between the characters in A Load of Old Bones. You're going to spend most of your time in the heads of a vicar, a dog, and a cat. I had a delightful time there; however, I don't think I want to repeat the experience. There are other books in this series, which came as no surprise because there was a strong foreshadowing of blackmail at the end, but I don't think I'd find another visit to Molehill to be nearly as much fun. I'd rather stop with this book and keep the good memories and the smile on my face.